$500 First Prize for the 2019 A Cappella & Unplugged Champion! In 2015, working with the Capitol Theatre, Franklin County Visitors Bureau (FCVB) started A Cappella & Unplugged, so 2019 celebrates five years of amazing talent. To expand the talent search, FCVB is working with Leadership Franklin County to add four open mic performances. The winner of each open mic is guaranteed a slot in the Round One performance, onstage at the Capitol Theatre in June 2019! Bring your talent to the Franklin County 11/30 Center on IceFest Saturday, February 2, at 4:30 PM to start your journey to a $500 grand prize and a chance to perform before thousands at the 1864 Burning & Rebirth of Chambersburg on July 20, 2019. Join the IceFest Open Mic performance by registering at Eventbrite. 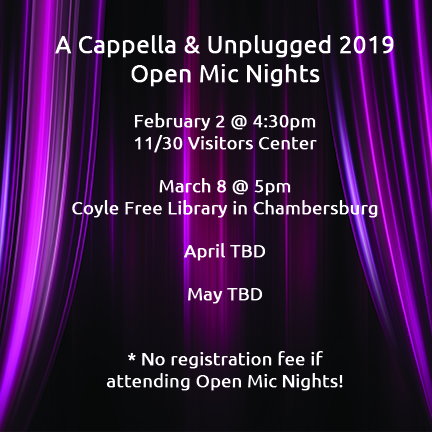 The registration fee is waived for all A Cappella & Unplugged Open Mic Nights. If you can carry your instrument(s) onstage, you can participate! Tonya Grissinger, former A Cappella & Unplugged finalist, is hosting February 2’s Open Mic! Past winners of A Cappella & Unplugged: 2015: “A World Apart” with Taylor Piper and Kristopher Potter of Mercersburg; 2016: Kate & Isaac, a duo from Waynesboro; 2017: Elly Cooke of Gettysburg; 2018: Alexus Lawson of Chambersburg. Open mic performances are just one way to participate in A Cappella & Unplugged. Auditions are also held in May. Up to 20 acts are invited to Round One at the Capitol Theatre in June. A panel of judges selects the top six acts to move into the Semi-Finals. Then, the public is invited to view videos of the six performers on Facebook.com/FCVBen and “like” the favorite performance. The three acts with the most “likes” move onto the Final Round at 1864 Burning of Chambersburg on July 20, 2019, where one act wins the $500 grand prize.